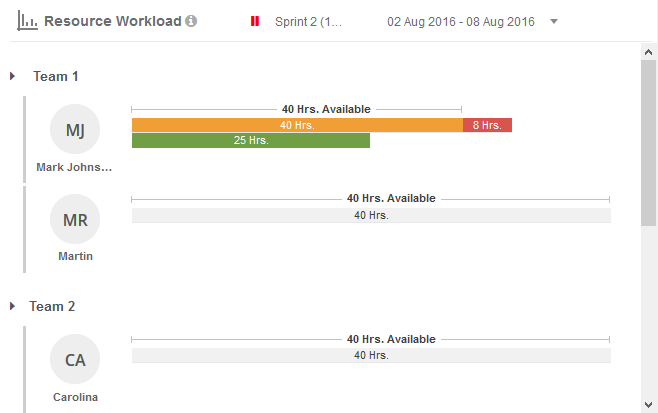 Resource Workload shows the ratio of work that has been assigned to team members for the sprint. 1. No Coloured Bar: Total Availability of a team member within a Sprint. 2. Green Bar: Completed Work by a team member (in Hours). 3. Yellow Bar: Assigned Work by a team member (in Hours). 4. Red Bar: Overloaded Work (in Hours). It shows that work assigned to a team member is more than its availability.